Nearly a month ago, I did a post called Environmental Book Club, listing green books for kids. I stuck with lists from The Nature Generation's Green Book Award because the book descriptions there seemed the least pedantic and heavy handed. In hunting for green books elsewhere it seemed to me that writing about the environment and environmentalists, ecology and ecologists, nature and naturalists always sounded instructive and dead serious. You want to argue that these are subjects which people need to be instructed about because they are dead serious? My response to that is, Yeah. Good luck with that. Does the expression "humorless treehugger" mean nothing to you? I am beginning a quest, people, a quest to find environmental/ecological/nature related books, for various age groups, that do not read like textbooks or sermons. There's got to be some out there. I'm sympathetic to the cause, and I still want my green talk palatable. I've found a very palatable green book to begin with. It even has a recipe. 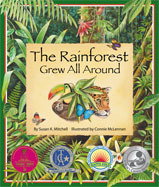 The Rainforest Grew All Around (for ages 3 to 7) by Susan Mitchell with illustrations by Connie McLennan is a lovely book that an adult reader can adapt to the interests of very young children and keep adapting as they grow older. the rainforest grew all around." and the seed in the ground." For reading with very young children, an adult reader might want to leave out the repeated pattern and move from the introduction of the new forest element directly to "and the rainforest grew..." When the children are older, you can read the whole thing. (It's like a new book!) When the children are still older, you can add the educational sidebar info. "Thick woody vines called lianas are usually as thick as an adult's arm." For teachers using this book (or parents who just have to be instructive) there are two pages of educational type things at the back. And there is a recipe for Rainforest Cookies, which use several ingredients that come from the rainforest. (Bananas, for instance.) I just made them. They're a little cakey for my taste, but a nice flavor. There are no value judgments being made in this book. There's no talk of damage to the rainforest, there's no call to action. Child readers can just feel part of that environment. The Rainforest Grew All Around is a beautiful looking and beautiful sounding book that children can grow up with. I approve of your quest, and wish you good fortune! This sounds like an excellent start. Thanks. I was really impressed by this book. This sounds like a wonderful book. I love that it works on several levels. THanks for sharing it as well as this blog post with the June Carnival of Children's Literature. I'm so glad people are interested in this book. It's a few years old (I usually post the publication date, but apparently I forgot on this post), and I'm always happy to bring a book like that to readers' attention.